But clearly Williams and those in charge of Empire felt that a more characteristic theme would be more appropriate in a film that revolves around the Empire gaining the upper hand against Luke Skywalker and the Rebels. And as Lukas Kendall points out in his notes to the trilogy’s soundtracks, the Imperial Motif “is the only major theme from that score [the original Star Wars] not to return in Empire.” Thus, it seems that the Imperial March was a replacement for the earlier theme. It is easy to see why Williams stuck with the Imperial March once he hit upon it—it is the perfect musical symbol for Darth Vader and the “evil” of the Empire in general. But even the music on its own seems to have this “evil” and imperial quality. How exactly is this so? One of the things that makes Williams such a master of film scoring is his ability to create meaning with many different features of the music, whether it’s melody, harmony, rhythm, orchestration, or anything else. It’s as if all the musical features are pointing in the same direction, so to speak, towards the character, place, or thing it represents. So how is this true of the Imperial March? Below I suggest some of the ways in my film music analysis. The march begins not with the tune itself, but with the accompaniment riff that is its backbone. Not only is this riff some of Williams’ most ear-catching music, it also packs a lot of the cue’s character into a very short span of time. In large part, this is due to Williams’ talent for aligning so many of the music’s features. On the first beat, we get just one note. Then on the second beat, we get a note plus a fast triplet rhythm—things are starting to move faster. Then on the third beat, we again get the note plus triplet, but it flows without stopping into beat four, which now starts with the triplet before coming to a halt. This creates even more rhythmic motion, as though the music just can’t stop until it reaches the end of the bar, then the whole thing starts over again. Combined with the rhythm’s militaristic sound through the triplets and the emphasis on strong beats, the overall effect is one of forward drive, suggesting a powerful and aggressive force that doesn’t let up until it gets what it wants. How do we know that this is an evil force specifically? A number of reasons. All of the pitched instruments playing here—the strings, horns, and timpani—are at or near the very bottom of their range. The result is a very dark color to the sound. There’s also the harmony Williams uses. With the first three beats, it’s not clear whether the march is in a key at all because we only hear a single repeated note, G. On the fourth beat, however, we hear a chord of Eb-F#-Bb (actually heard as Eb-Gb-Bb), all of which are notes in G minor, so the color of the sound is made even darker by confirming a minor key for the march. Not only that, but the chord itself is a minor version of a chord that would normally be a major chord written as Eb-G-Bb. Because Williams’ use of the chord is not the normal one but its darker minor version, it is an ideal match for the evil Empire and the Darkside of the Force. The riff is stated four times before the melody comes in. The first two times, we hear the abnormal minor chord described above. But the third and fourth times, Williams adds the note A to the chord, which scrapes against the Bb already in the chord to produce a gritty and biting dissonance. This dissonance evokes the harshness and terror of Vader’s and the Empire’s ways. Thus, even before we hear a note of melody, much of the character of the march has already been established by the meaningful riff that is its accompaniment. 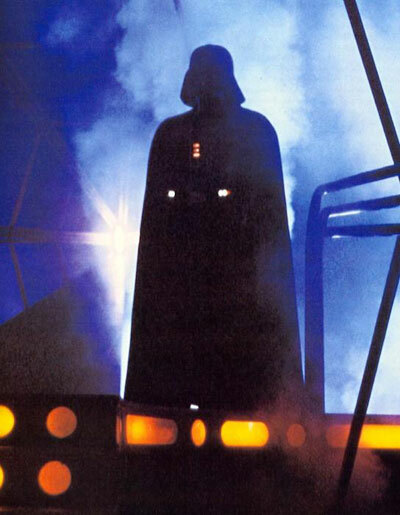 This gives the march a sure-footed character that wonderfully depicts Vader’s unwavering confidence. And since this rhythm is the basic motive for most of the march, the confident tone is carried through the whole piece. The dark orchestral colour of the opening riff is also continued into the main melody, which is sounded by trumpets and trombones in a mid to low register. Recall that the climactic high note in the first few bars of the Star Wars main title music, by contrast, uses the trumpet at the very top of its range to suggest heroism (see Part 2 of this series). The lower range employed here is in keeping with the more menacing feel of the opening riff. And the use of brass instruments gives the sense of considerable military might. The harmony of the first twenty bars of the march (the portion we hear in the film) also contributes to the dark color of the music. To start with, just about every chord we hear is a minor chord. The brighter, happier sound of major chords are completely banished from the music. Had Williams used the regular versions of these chords instead, the march would have had a far more normal (and unremarkable) sound. The infusion of chords that almost sound like normal ones, and minor chords at that, gives the impression of a darkly abnormal, evil worldview. Just for fun, I’ve transposed these distorted chords down a semitone in the recording so you can hear what the march would sound like with the more normal chords. It becomes easier to hear how Williams has distorted the harmonies when this is compared with the original. Clearly, Williams’ original is much, much better. In the first idea, when the melody finally moves on its fourth beat, it leaps in the downward direction, suggesting a negative influence. And although the melody then rises to a higher note, it immediately leaps down again with two quick notes. These gestures are then repeated, emphasizing the negativity. 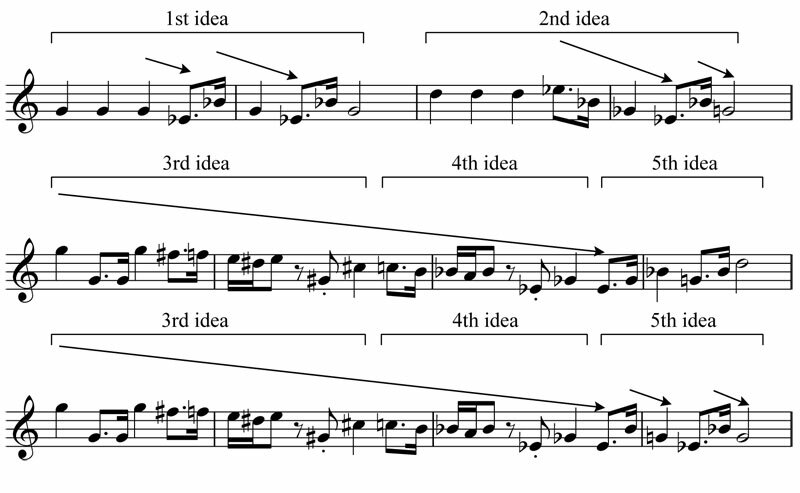 In the second idea, the melody rises higher than its original starting point, which allows it to fall from a greater height and give it more impact, a bit like dropping a heavy object from higher up. Since the musical elements are suggestive of something evil and powerful to start with, it forms such a strong bond with the evil and powerful aspects in the scene that music and film become welded together. Without Williams’ remarkable alignment of so many of the musical features, it is almost certain that the Imperial March would not be as well known or well liked as it still is today. Coming soon… John Williams Themes, Part 4: The Raiders March. Great analysis. Thanks for sharing it! marvellous …so interesting to hear it with the simpler harmony…what a change . Amazing work with spot on reasoning! Really wish someone was doing this type of thing sooner, can’t wait for your book. tu sais qu’elles sont les instruments utilisé dans ce thème ? are you know they are the instruments used in this theme? @Boron: The John Williams Signature Edition of the Star Wars Suite has the Imperial March in full score. There, the theme’s melody is scored for 3 trumpets, 2 trombones, and 1 bass trombone. The march accompaniment is played by the strings, timpani, and snare drum. But this is the concert version of the piece. There may be some minor changes in the film version. But the sound of the concert version seems to be very close if not identical to the film version. heyy.. does anyone know the name of the author for this analysis? The Imperial march is actually first heard in a truncated form in the piccolo, disguised at the back of the texture just after the opening title sequence- as soon as the Empire are on screen in ESB we get the new theme in its embryonic form. Hi, Tristan. Thank you for your observation on the piccolo hinting at the march. I’ve amended the article to allow for that now. As for my allusion to counterpoint, I meant that I was referring to the paragraph on “dissonance” I wrote in the section on the riff. I probably just should have said it had dissonance when I was summarizing. Thanks for this analysis that is very much appreciated. For a long time I had been seeking for an musical analysis of this theme that is so special, and especially so hard to sing a cappella. – it seems (to me, at least) that there is a typo in the fourth included score (the first one with the “ideas”). The displayed last note of the last-but-one bar is a G. I think it should be a B (flat), like in the fifth score (the same one as the one before but with added arrows to show the melodic movement). – when mentioning the substitution of iv#/v# to iv/v, you did not mention the presence of a triton between the G (that we can consider to be the tonality) and the C#. The movement from i to iv# could hence be considered as a sort of minor tritone substitution, which is probably far away from the original tritone substitution, that originally applies to 7th chord. However, I want to point out the sort of balance between tritone separated chords, here minor chords i and iv#: you can move from the one to the other or vice-versa, without any change in the feeling you have. i.e. if you play alternatively i and iv#, at a certain moment, you will not remind any more which one is the tonality and which one is the accidental (strange) chord… With minor chords, the effect is emphasized and creates a very particular feeling which, in my opinion, weights a lot in the Imperial theme listening. – Last thing : why is it so impossible to thing? … at least for me, who perceive music in an much harmonic way. People that are more “melodic listeners” (with a perception more based on intervals) probably find it less difficult to sing… I think the issue stands in the middle of what you named “3rd idea”. The chromatic run from the upper G to the E (passing by D#) is okay if you only consider it as a chromatic movement to the 6th degree of G minor (i). But actually it is not, it a transition to the tritonic iv# mentioned above, which is not very clear with the G# that follows, but which is fully confirmed at the next bar, with the C# (and with the help of the harmony of the orchestral accompaniment!). The E becomes now the third of this new C# minor chord. The problem is that when you sing it a cappella, without any accompaniment, moving from i to iv# is just impossible, especially if your harmonic memory has been disturbed by the chromatic run : changing the perception of this E as the 6th of G minor to the 3rd of C# minor is a nightmare! Afterwards, coming back to i (middle of 5rd idea) is less difficult, thanks to the v# that helps a lot: iv# to v# is okay, especially if you consider C# as the temporary new tonality (it’s just a i (C#) to ii (D#) transition). Then iv# to i is easy too, as the third degree of iv# (F# or Gb) is the leading note of G.
This is my own attempt to explain why it is so difficult to sing, and I would be interested in confronting it to other views. Thanks for such detailed thoughts, Dibou. Yes, I agree that the tritone relationship makes this difficult to sing, and your analysis is quite convincing. Making it hard to sing, or at least unexpectedly “odd” or “unnatural” is, I think, part of the whole “evil” sound of the theme. The Emperor’s Theme is somewhat similar in that, while the melody is not exactly hard to sing, the harmonies are bizarre and would be hard to hear given the melody it has. Evil and even strangeness seem to have these associations with non-functional chord progressions for Williams. The Ark Theme from Raiders is another one that uses a string of non-functional minor chords like Vader’s or the Emperor’s Theme. And he uses it quite a bit in underscore too when the situation is rather intense as in a scene of action or mystery. Interesting stuff! Thanks for helping me with my music homework? These analyses have proven one of my best resources for the research essay on John Williams’ use of leitmotif that I’m working on at the moment. You don’t think you have time for me to interview you for your thoughts on some of the other themes and motifs, would you? I would be so grateful. You make such complex parts of music theory so much more accessible and easy to understand. Thank you very much!